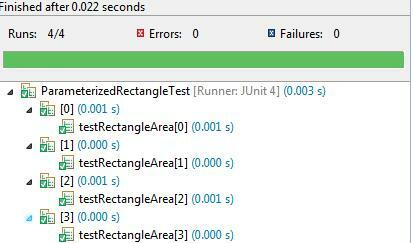 @RunWith(Parameterized.class) : by default JUnit tests run with the JUnit test runner. However, if you’re using a mock framework (JMock for example), than you might need to run with the corresponding runner. Parameterized tests run with the Parameterized runner; by stating this you will let JUnit know that you’re supplying test data through a data provider method. @Parameters: this is the method that will provide the test data. It has to be both public and static. It’s return type is a Collection. Usually it does not do anything, just returns a set of values, input data. Constructor: not very usual in case of JUnit tests. Try not to use one, you’ll instantly get an IllegalArgumentException. Here you are able to access the current test data, build objects, just the usual constructor stuff. And mainly that’s it. Pretty simple, after all. When you run the tests, JUnit will test the getArea() method with each and every piece of the test data described in the parameters() method. In a larger project, chances are quite high that you’re using a mocking framework. Common things required by the mocker are usually grouped together into fixture files (along with the @RunWith annotation). If you have different runners, you have to specify every time which one you are using, and this makes test files more noisy. If you tried it out, you know by now that the results will be something like this: well, these are not very self-documenting names. There’s no way of knowing which are normal cases, special cases, edge cases, error cases etc. If you break one of these test cases in a large legacy system, you are going to have a bad time finding what went wrong. Ever tried to figure out what a class’ responsability was, just by looking at its test cases? You can’t do it here, as you have only one test method. Usually we do not write test cases just to have more test cases. We write test cases to create/validate behavior. In this context this bunch of test data seems useless, as they all test the very same behavior. It’s hard to get. Someone who has never seen such test cases may be confused about the unusual layout of the class. In every case I ran into such tests the actual test method was long, full of asserts and even full of other stuff, like loops, try-catches etc. Anyway, I’m open to new ideas. If you’ve ever used parameterized test cases successfully (and ended up with clean and understandable code), feel free to share.